It prevents cats from going into heat. It prevents cats from getting pregnant. It significantly helps prevent cats from get breast cancer later in life. It prevents cats from getting uterine infections later in life. In addition to these medical reasons, it prevents unwanted pregnancies, a significant problem in our society. Millions of cats are euthanized every year because they are strays. We usually spay a cat when it is around 6 months of age. This timetable is variable, the important point is to perform the surgery before it goes into heat. Increasing daylight encountered in late winter and early spring stimulate female cats to go into heat. On the day of surgery we need your pet in the hospital between 7:30 AM and 9 AM. Please take away all food and water when you go to bed the evening before surgery, and do not give your cat anything to eat or drink the morning of surgery. It will go home in the late afternoon the day of surgery. Please call our office at 4 PM for pickup time, you will be given post operative instructions then. At the end of this page we have a short QuickTime video when we spayed our hospital mascot Elbee. You need QuickTime from apple.com to view it. Pre-anesthetic preparation is important in every surgery we perform, no matter how routine. All of our spays receive a physical exam prior to surgery. After this exam will we draw a small amount of blood for an in-hospital pre-anesthetic test. When everything is to our satisfaction we will administer a sedative. This will calm the pet down and make the administration of the actual anesthetic, along with post operative recovery, much smoother. Once a pet is anesthetized, prepared for surgery, and had its monitoring equipment hooked up and reading accurately, the surgery can begin. This area contains graphic pictures of an actual surgical procedure performed at the hospital. It may not be suitable for some children (and some adults also!). 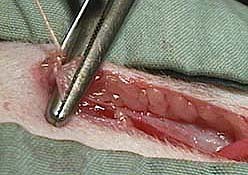 The spay procedure begins with an incision in the skin. We make a small one (we call it a bikini scar when it heals) because it minimizes anesthetic time when we have to suture the skin and muscles back together, and to minimize post operative discomfort. Smaller incisions also heal faster and minimize the chance of complications. We pick a specific location on the abdomen to make our incision. This location minimizes skin bleeding, gives us direct access to the muscles we need to go through to get into the abdomen, and puts us directly over the ovaries and uterus. All our spays are performed under sterile conditions. Our surgeon is making this incision near the umbilicus (belly button) on this cat. It is important to go through the abdominal muscle in the proper location. This location is called the linea alba, and is the area where the abdominal muscles meet. 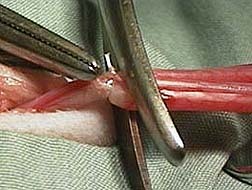 Making the incision here will yield almost no bleeding, and gives the surgeon a strong anchor to sew the muscles back together. 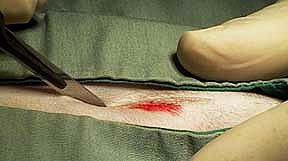 We start the muscle incision with a scalpel, then complete it with the scalpel or a scissors, taking special care not to cut any internal organs. An instrument called a spay hook is commonly used to bring the uterus out of the incision through the small opening in the muscle. The surgery is performed outside of the abdomen. We gently pull up the uterus until we have the ovary exposed. The ligament that attaches the ovary to the bottom of the kidney is gently stretched to allow complete visualization of the ovary and its blood supply. The metal tip of the hemostat on the left is pointing to the ovary. This is a picture of an ovary cyst from a different cat. This is one of the problems that can occur when a female cat is not spayed. Three clamps are used before we cut any tissue. The first two clamps on the left are where we will put 2 separate sutures. 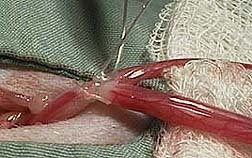 To the right of these two clamps is a scissors that is in the process of cutting the ovary (arrow) away from the body. The last clamp on the right prevents any bleeding from the other direction. 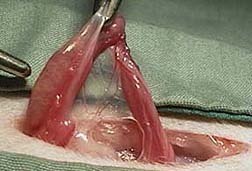 All that remains when the ovary has been cut away is called the pedicle, shown as a second suture is being applied. What remains will be placed back into the abdomen. The first ovary that is removed (labeled on the right) is left with a hemostat on to minimize bleeding. The surgeon is starting to gently pull the other ovary out of the abdomen, and will repeat the same clamping, suturing, and cutting process as the first ovary. When both ovaries have been removed from their position in the abdominal cavity they are gently pulled to the right. This brings the cervix out of the abdomen and allows the surgeon to remove the uterus from the cervix to the ovaries. 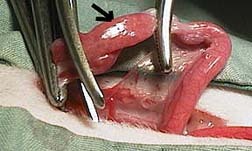 Two sturdy sutures are placed on the cervix before it is cut. 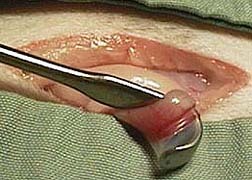 When the surgeon is certain there is no bleeding where the cervix is cut it is gently placed back into the abdomen. 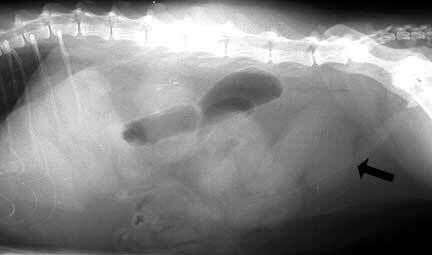 Unspayed cats are at risk for a disease called pyometra. This is an actual infection of the uterus, and can be very serious. It is diagnosed in several ways, one of them being a radiograph. The black arrow points to a tubular structure in the abdomen of this cat this is a pus filled uterus. This is what a pyometra uterus looks like. It includes the ovaries (arrows) at the left along with the cervix at the far right. If you look closely you will notice the swollen appearance to this uterus. This is an infected uterus that was removed from an older cat. If this cat had been spayed before its first heat, there is minimal chance it would have had to suffer this infection. When our surgeon has made sure that all internal sutures are holding well and there is no bleeding, the process of sewing up begins. The linea alba is sewn first, seen here with stainless steel sutures. Stainless steel is very strong and causes minimal tissue reaction, so it is sometimes used. These sutures can easily be seen on an x-ray, a nice way to tell if a female has been spayed, especially for stray pets. In many cats we place the skin sutures just under the skin, so there is no need to return for suture removal. When the hair grows back in, it is impossible to tell any surgery was performed. It is at this point that we will give a pain injection, which might make this cat groggy for the evening. When you pick up a pet after a spay operation you will be given detailed post operative instructions. Most cats go home late in the afternoon on the day we perform the surgery. They might be groggy from the pain injection which is advantageous because they will remain calm and allow the healing process to start immediately. By the following morning the grogginess will have worn off. When you first get home do not be in a big rush to feed. after 1 hour at home offer a small amount of food and water. If the appetite is good, offer more several hours later. Do not over do the feeding the first night because anesthesia can make them nauseous. Keep contact with children and other pets to a minimum the first night, and restrict activity for several days to allow the incision to heal. Do not let your cat go outside until healing is complete.